Today, Singapore celebrates its 41st birthday. So today of all days, I thought it would be appropriate to make, eat and write about something that I felt was very typically (though not uniquely) Singaporean. 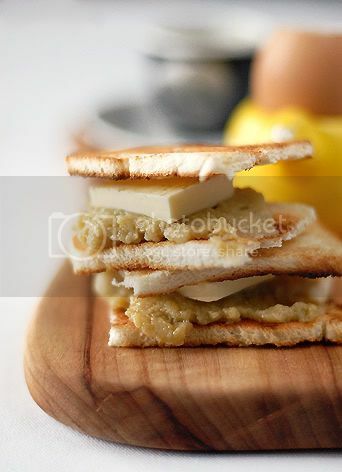 While there a myriad of dishes that are beloved by my countrymen and women and some which are considered by many to be “The Great Singaporean Dish”, like chicken rice, fish head curry or laksa for example, to me, nothing is more Singaporean than a breakfast composed of kaya toast and soft-boiled eggs. For foreign readers, kaya (or serikaya, as it was originally called) is an egg jam, made with coconut milk that’s been infused with the aroma and taste of pandanus leaves (also just called pandan). It’s a Malay and Nonya (Straits Chinese) specialty. Local food historians trace its origins back to to the Portuguese, who, during the height of the spice trade, had established major trading outposts in the Straits of Malacca. “Kaya toast” combines this rich, delicious jam with thin slices of toast and cold bits of butter. Traditionally, the bread is toasted over a charcoal fire. The combination is, while simple, quite heavenly. The sweet jam contrasts wonderfully with the savoriness of the butter. The crispy toast also acts as a good counterpoint to the two spreads. Kaya toast is usually served with soft-boiled eggs (flavored with soy sauce and pepper) and a cup of exceptionally strong, sweet coffee. All across the country, thousands upon thousands of Singaporeans wake up every day, get dressed and head out to their favorite coffeeshop for the nation’s favorite breakfast. For many, the day doesn’t even start properly without digging into this now classic combination. I’ve never tried making my own kaya before. And while I own several local cookbooks, including some fantastic old volumes handed down to me by my mother, I decided to ask an expert for some help. Christopher Tan is my go-to guy when it comes to Nonya food. Unlike me, who rambles aimlessly on the Internet, Chris actually makes a living writing about and working with food. He’s an extremely respected food writer with several cookbooks under his belt, a great photographer, and one of the few and best food stylists in the region. He also comes from a family of food journalists. His book Shiok! is the one volume that S and I always recommend to anyone interested in learning to cook Malaysian and Singaporean dishes. Chris passed S and me his family’s favorite recipe and has graciously allowed us to share it with all of you. Unlike the kaya used in most coffeeshops, which is creamy and smooth, Chris’ recipe yields a slightly more dense, custardy kaya. He contends that traditional Nonya kaya is made this way. You should be able to, he told me, slice it with a knife. The soft, spreadable kaya that most coffeeshops, including Ya Kun and Killiney Kopitiam (the two most famous kaya toast places in town), serve is a Hainanese adaptation. The recipe worked well. In fact, it was surprisingly easy. Easy enough to make me wonder why anyone would buy commercially-made kaya. S and I had steamed our kaya for only 90 minutes (Chris recommends between 90-120 minutes), so it wasn’t too firm, i.e. easy to spread. Paired with some nice French butter (which S stores religiously) over hot toast, this really made my (National) day. Combine the eggs, sugar and salt in a large bowl. Stir (do not beat) with a whisk until the sugar is dissolved. Tie six of the pandanus leaves into a knot, bruising the leaves to release the pandanus aromas. Put the coconut milk and pandan into a saucepan. Slowly heat it up until it begins to boil. As soon as it reaches the boil, pour it over the egg mixture, stirring it in carefully. When blended, take out the pandan and strain the mixture through a sieve into the top part of a double boiler. Gently heat the mixture, stirring constantly, until it just begins to thicken. Meanwhile, tie your remaining pandanus leaves and place them in a heatproof bowl or loaf tin. Then sieve the mix into the container. If you use jars, use wider, shorter jars; you can also put one tied pandanus leaf into each jar. Cover tightly with foil. Make a few small incisions in the foil so steam can escape. Place the container (or jars) into a steamer and steam for 90 minutes to 2 hours, or until firmly set. Cool and then keep covered in your fridge. It will keep for a week. Malaysia has now a few ‘Kopitiams’ that serves Kaya n toast, half boiled eggs and that dark original taste coffee. So authentic! You should try eating french toast with kaya. Absalutely gorgeous! hey…. thanks for the post on national day. Have been reading your blog for sometime now and your pics are AWESOME. I tell myself i need to get a camera like yours for my blog too. haha….. thanks man…. always admire a guy, who loves his wife, his family, his friends and his food! Oh Chubby Hubby, this may be the first time I’ve ever not felt my mouth water by your description. Kaya is just too, I guess mushy for me. I like my spreads to melt into my toast, and when you can slice kaya and it just sits on top it just doesn’t do it for me. I can see why you would choose it as a national breakfast though! Happy National Day! Nyetzy: Thanks. Glad I could inspire you to make your own kaya. Ana: Who knows? If your kaya is good enough, you could open Manila’s first kaya toast cafe. Jeanne: That would be awesome. Thanks. Thycountess: Oh yum, I really like french toast shmeared with kaya. Good call. Ling: Sure, just pour the mixture in a deep saucepan and stir it over really low heat, checking to ensure it doesn’t overcook. For proper thick Nyonya style kaya (you can turn the jar upside down and the kaya won’t budge!) in Kuala Lumpur, go to the Taman Tun market, to Liza’s Stall and get the kaya there. The same kaya is also sold at Little Cravings at 1-Utama but more expensive lah! 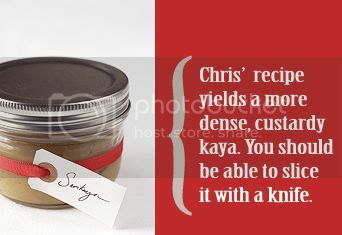 Chris actually cooks his kaya in a pot directly on the stove (as CH has suggested), but he has been making kaya for a long time 😛 I find that when you’re doing it the first few times, having a water bath of some sort helps. Otherwise you go from kaya liquid to scrambled kaya in mere seconds. It can be very frustrating. If you don’t have a double boiler, sit a metal or glass mixing bowl over a pot of simmering water (the bowl should be large enough so that it doesn’t fit completely inside the pot. The pot rim should sort of hold the bowl up). The effect is similar. Make sure that the base of the bowl doesn’t touch the water in the pot. If this sounds too troublesome, then watch your kaya closely when you do it on the stove and keep the flame at its tiniest setting. My mum can make kaya as well, so it is really yummylicious. But sad to say I’m too lazy, or shall I say in typical Singaporean lingo, NO TIME LAH! 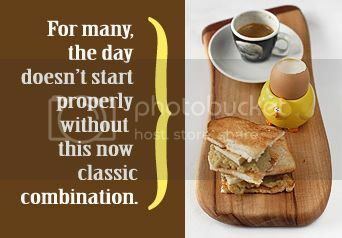 Inspired to have kaya toast, soft-boiled eggs and coffee for brekkie. Went Ah Mei and ordered the usual set. Why is it that besides Ya-kun here, the other’s (Kiliney Kopitiam included) do not crack your eggs for you? And it gets all your fingers dirtied and the job of removing the shells from the whites is just too messy for morning peak hour rush. I like my brekkie fuss-free, and preferably I do not need to go wash my hands just “slurp the coffee and the eggs” and chomp the bread. hello ch! was introduced to your wonderful blog very recently and have been enjoying your posts and pics tremendously. thank you for this kaya recipe; it sounds fabulous (and easy) so i shall bravely attempt it one day soon. Hmmm.. thanks for sharing. I love Kaya.. but it’s hard to get good one nowadays in the market. This seems a bit like a custard kaya huh? Let me try it out and see. I was taken to eat this dish at Ya Kun Kaya Toast by the Singapore Tourism Board. Cheap bread, waaaay too much butter, weak coffee and undercooked eggs come to mind… I reckon it would be better if made with some care, but in my opinion Singapore has much, much more interesting food than this! In Thailand sankhayaa (as it’s known here) is often served over sweetened sticky rice,the whole morsel wrapped up in a banana leaf package. Attractive and delicious. I love Kaya and could eat it anytime! I’ve made it myself a few times and it goes very well together with Zopf (Swiss bread) and any other kind of bread (white, brioche, etc…). Nekochan: Thanks for the heads-up. Anonymous: I love that Ya Kun always cracks your eggs for you and that they are always perfectly done. Amazing how consistently great they are. August: Thanks and good luck. Zara’s mama: Good luck. Yah, it’s a tad more custardy. Steam it for just 90 minutes like we did if you want it more spreadable. Austin: To each their own. I love a kaya toast brekkie. And while it may not be the most interesting food, it is very, very local and much beloved. yum… especially with a cup of hainanese kopi on the side. I always teased my dad that when he had butter on his toast, a casual observer might have thought he was in fact indulging in cheese. Looks like you have the same approach as he does. wonder if it works as well if I were to bake it in the oven in a bain marie – think I should cover the kaya with foil? oops, meant to ask you where you’d purchased the lovely jam jar. imagine it would make a lovely pressie to friends and family. Babe_KL: One coconut should be adequate. Siewyuk: Definitely cover it with foil if you’re going to put it in a bain-marie in the oven. Prick the foil so that the steam can escape. The jars are from Muji. I may try just cooking it in the double boiler the whole time, like Ping does, rather than steaming it. jus wondering .. what is the different between nonya and haninanese kaya.. keep seein kaya from this two type.. but isnt it the same? wha..
CH, I tried tha kaya recipe but it was a disaster. Not sure where I went wrong. The kaya turned out too sweet and then it is very ‘coarse’. After steaming, I can see a lot of bubbles trapped in the kaya. My hubby said I put too much egg but I followed the recipe. Nevertheless, taste wise is OK, very fragrant. If you know where my mistake is, do tell me pls. Hello! I’ve recently discovered this blog and I’ve became a big fan. I’m from Portugal and it is funny you mentioned that the origins of Serikaya trace back to the portuguese. In fact, there is a dessert from a region of Portugal (Alentejo) that is called sericaia, wich is similar to your kaya, except we use cinnamon and regular milk, instead of pandanus leaves and coconut milk. Please, keep your wonderful reviews and recipes coming! I wish we had something like that. A national day of breakfast would be so awesome. And all the restaurants would have free breakfast.. it would be the best day ever. Thanks for the kaya recipe! One question: Any particular reason as to why we have to knot the pandanus leaves?